I am very happy that you like it Brother! 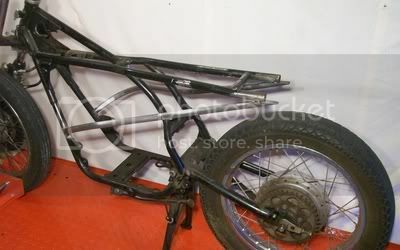 I could never leave the factory rear tubes as they are both offset to the same side so when you look at the bike from the rear it does not look uniform, this design may add a little stiffness and take a little of the flex out of the frame however you have to be careful when adding new bars to a frame as taking flex away from one area of a chassis will often move it to another place in the chassis. I tried to keep the attachment points of the new frame rails close to places in the frame where there should not be a lot of flex in theory, the front of the new frame rails attach to the front down tubes very close to the front engine mounts where the engine is bolted in place and already connecting the two front down tubes and where we are attaching the new frame rails in the center of the bike to the rear down tubes there is already a factory cross brace to connect the two rear down tubes so hopefully the new frame rails will help slightly with out moving too much flex to other areas of the chassis. Actually no Brother, as I mentioned previously the studs do not have to be removed to remove or install the engine as they will clear the new frame rails. I only removed the studs for cleaning as I was starting to take the engine apart for the rebuild however I needed to set the bottom end of the engine back in the frame and set the cylinders in place so that I could check for clearance around the cylinders while I was bending the tubing for the new frame rails. The engine may even go in with the cylinders in place however I have not tried yet to see as if they will clear it will be by installing the engine from the right side and I have not installed that frame rail yet. This is not a track only bike so we do not plan on having to remove the engine often and even if it was we would always replace all of the gaskets with new ones every time we removed the engine for inspection or rebuilding. I know Brother, thank you for your support and it is always good to have you here with us! I always enjoy talking with you my friend! Joey, good to see that you still like to push the envelope. 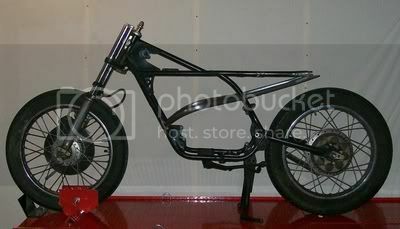 What I haven't worked out yet is the objective of the frame modifications. 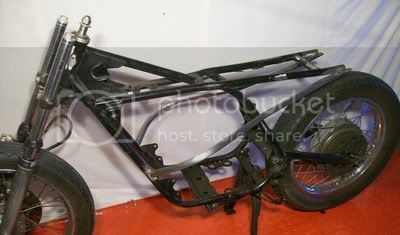 Suspension forces applied to the new tubes will tend to twist the rear triangle upwards more than a stock arrangement. Maybe not by enough to be an issue, but those frames are not super stiff to begin with. 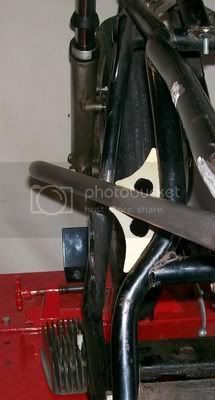 Directing any extra force into the front downtubes might add to the way that stock frames crack above the engine mount and below the swingarm pivot. 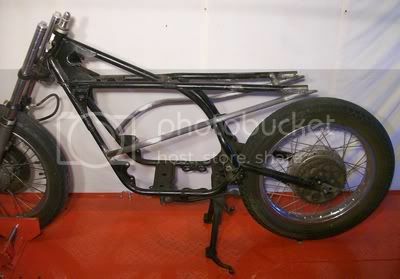 The revised frame design mimics a Big Tube Spondon but they typically have no lower frame tubes and the motor drops out of the bottom. They are also a much stiffer design, but that's another story. I doubt that the frame will be much, if any, more likely to crack in street mode than a stock frame, but it is unlikely to be any stiffer either. It might tie the swingarm pivot and steering head together more stiffly, but I wouldn't bet on it, so let's assume for the moment that it comes out awash. That's a lot of work for aesthetics. I'm not knocking it, just thinking out loud. With the right paint and graphics it might just update the look of the bike and make it stand out as different. That can't be all bad. Brother Teazer I was truly hoping you would join in and share your thoughts on this design as you know I always value your knowledge, I agree with you and do not believe that the design will add much stiffness to the frame and I was actually trying to prevent adding too much which was the point that I was trying to make when I responded to Brother 50gary as to why I placed the attachment points where I did as I really do not want to move too much of the flex around on the chassis. As for adding stress to the front down tubes, where the new frame rail intersects with the rear down tubes I designed the new frame rail so that it is roughly an inch away from the rear down tubes and am planning on adding two short bars on each side to tie the new frame rail to the rear down tube forming a small triangle on each side which should alleviate some of the stress from the shock pressure from travelling forward to the front down tube, what do you think? 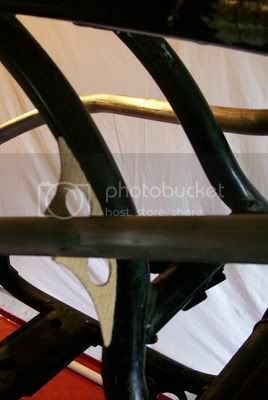 I am also planning on adding a couple of new gussets to the frame to help with the stress and to prevent cracking. As for pushing the envelope and not following the herd you know me Brother! If I were adding those tubes, I'd want to tie them in nice and tight to the rear down tubes. I'd lightly notch them and weld tube to tube and then add a small sheet metal brace to lock them in tight. 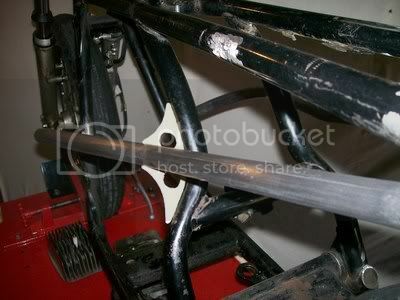 The rear suspension tubes need to be tied in and not move. If the new tubes have nay flex, it will put the rear suspension force into the front tubes at the wrong place. If the front connection point were around the top engine mount it would be more effective IMHO. Brother those Spondon big tube frames are absolutely gorgeous however I think that type of design it a little too modern of a look for what we are looking for on this RD. 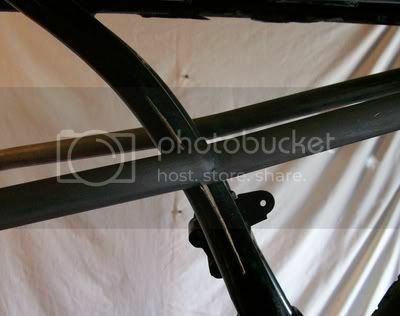 I tried to take a couple photos of where I am going to tie the new frame rails to the rear down tubes however it is hard to show in a photo as the new rail looks like it is touching the down tube in a photo when there is actually about an inch of clearance. The way I am planning on connecting the new frame rails to the rear down tubes the rear suspension tubes should be really tight and not move at all, I am also adding a triangle shaped gusset in the corner just below the top frame tube and behind the rear frame down tube and I will be enclosing the rear shock mounting point with a triangle box section so that the top frame rail will only have a roughly ten inch span between the gusset and the box section. 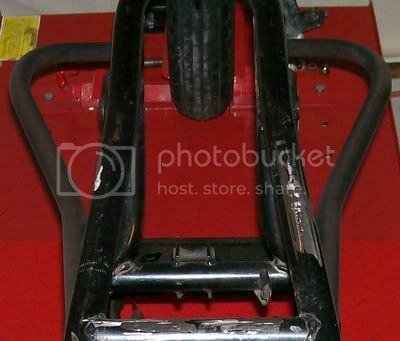 As for the new frame rails mounting location to the front down tubes you may not be able to see it very well in the first photos I posted however they do connect around the top of the engine mount, there is roughly 3/8th's of an inch between the bottom of the new frame rail and the top of the engine mount. I added the new right side frame rail today! We had originally planned on connecting the new frame rails to the rear down tubes on each side of the frame with two one inch pieces of tubing to form a triangle however after looking at it today we felt that a nice gusset would be stronger and would also look nicer! We designed a gusset and cut it out of cardboard so that we could set in on the frame to see how it would look and we really like the design so I am going to start building the gussets out of 3/16th's steel plate. We are going to slightly curve the gusset so that it matches the curve of the rear down tubes when looking at the bike from the side. We are also going to skin the back side of the rear down tubes that you can see in this photo with some nice aluminum from the top of the frame down to the swingarm to protect the carburetors and engine from any water, dirt, or rocks that may come off of the rear tire. The down tubes have a really nice curve to them and they have a nice step in them on the sides so I am going to build the aluminum shield with the same curve and shape which I think will look really nice!